As the cars on the road get older and more owners are stretching their dollars by doing simple maintenance functions, an automotive readiness kit could be just the gift for your favorite gear jammer. Over half the country’s do-it-yourself types are doing even more of their own repairs this year and 77 percent of those who usually don’t do repairs may attempt them due to economic concerns, according to the AutoMD 2012 DIY Report. Additionally 51 percent of those surveyed plane to drive their current cars until it dies while 69 percent have every intention of driving their present ride 50,000 miles more than other vehicles owned, based on a poll performed by Auto Parts Warehouse. 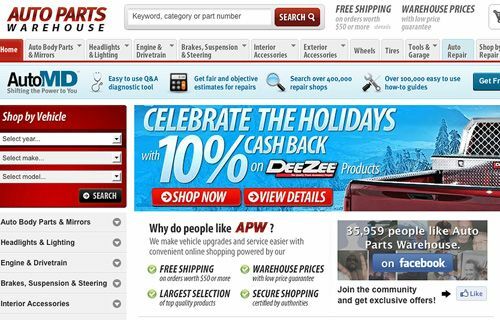 Auto parts are increasingly bought online, also part of an effort to save time and money, with online auto parts sales expected to reach a staggering $3.5 billion this year, according to April 2012 Hedges & Company Report. "It may not be the world's most glamorous gift, but when you consider that a majority of people spend between $500 and $1,000 each year on vehicle repairs/service/maintenance, this easy-to-put-together gift of preparedness and safety will keep on giving and saving money throughout the year," said Shane Evangelist, CEO of U.S. Auto Parts. "For the person who has everything or for the first time car owner or for those whose finances are strained with vehicle upkeep, an Auto Parts Readiness Kit makes a thoughtful and creative gift." Just a little research into the vehicle concerned allows the assembly a package of parts most likely to need replacing within the coming year. Make sure to get the right parts for the year, make and model of the vehicle to be outfitted. If you need help installing any of the parts purchased, plenty of online resources are available to aid you in doing it yourself. Windshield Wiper Blades – Wiper blades are easy to replace and if you’ve ever been caught in a storm with worn out wipers, a spare set could be a lifesaver. After all, visibility is critical to safety and windshield wiper blades only last so long. Fuses – Though the fuses of today last much longer than they used to, they are easy to replace and a vexing aggravation if something such as your lights, gauges or heater is out of commission. It’s not a bad idea to carry a complete set of replacements for all the fuses in your vehicle. Bulbs – In some older models, a simple thing like a bulb for the vehicles exterior lights can mean a lot to the safety of auto occupants. Not only that, it can attract unwanted attention from the local constabulary and possibly a ticket for operating an unsafe vehicle. As a rule of thumb, light bulbs are cheaper than citations. Filters – Air filters especially can become clogged in windy, dusty areas and can cause a car to run rough when befouled. Routinely changing the filters that remove harmful particles from the air or fluids such as oil or gas, are necessary to maintain engine life and performance. Air, fuel and oil filters should be changed regularly to keep your car running well. Fluids – The precious bodily fluids of a vehicle include oil, brake and transmission fluid, windshield washer and antifreeze. Levels need to be maintained or replaced when dirty. Keeping a proper levels of antifreeze coolant in your car protect your engine from overheating and/or freezing during cold temperatures. A tire sealant is a good idea, along with a bottle of HEET or an equivalent in places where water is likely to get into fuel (though gasohol makes this less needed than it once was). Other ideas to keep an auto or truck lover safe and on the road include a battery charger, jumper cables, an electric car jack, tire chains and safety triangles or reflectors, in case you have to perform roadside repairs. Stocking stuffers include snow-scrapers, scented air fresheners, decals, stickers and other small accessories. Bigger gifts for the auto enthusiast include floor mats, seat covers, steering wheel wraps and cargo liners. Theoretically, your sleigh doesn’t have to do the kind of duty Santa’s does, but you’ll be happy to know your Santa is safe and happy on the road next year with a little thought and an automotive readiness kit. May your holidays be filled with sweet surprises!